Not altogether uneventful, but a day with few physical challenges, and in that sense, a welcome change. 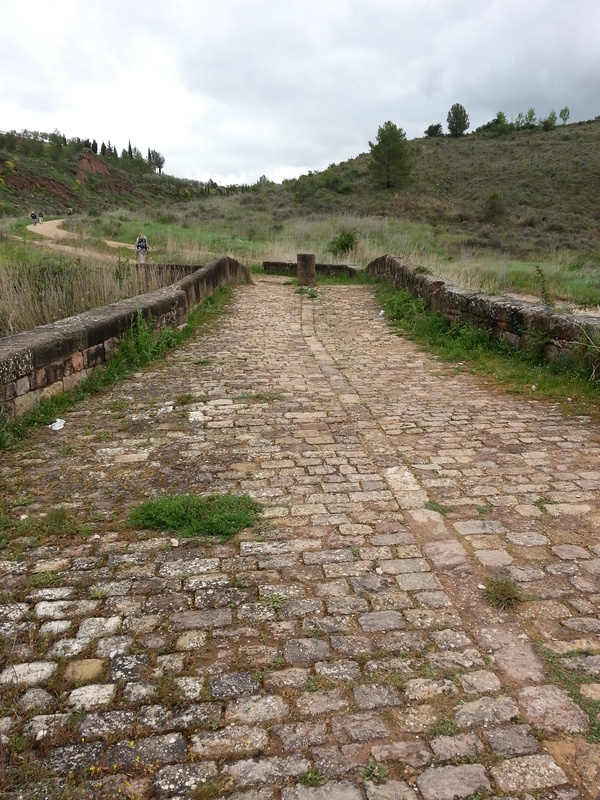 We experienced short climbs up and down into the small villages of Maneru, Cirauqui, Lorca, and Villatuerta, each of which had something remarkable, be it a church or bridge that was unique. Along the way, we saw our German friends who waved to us as we passed them and they passed us. We encountered Sandra and Cynthia along the way in the small villages. They were stopping for coffee and potty breaks at various bars, a common practice among many of the pilgrims. Greg and I were prone to just drinking water and using the great outdoors as our rest room. Before long, Greg was having problems with a blister on one of his toes and had to stop to make some further adjustments to his boots. We walked for some time with a retired Irishman from Dublin who was quite interesting to talk to. 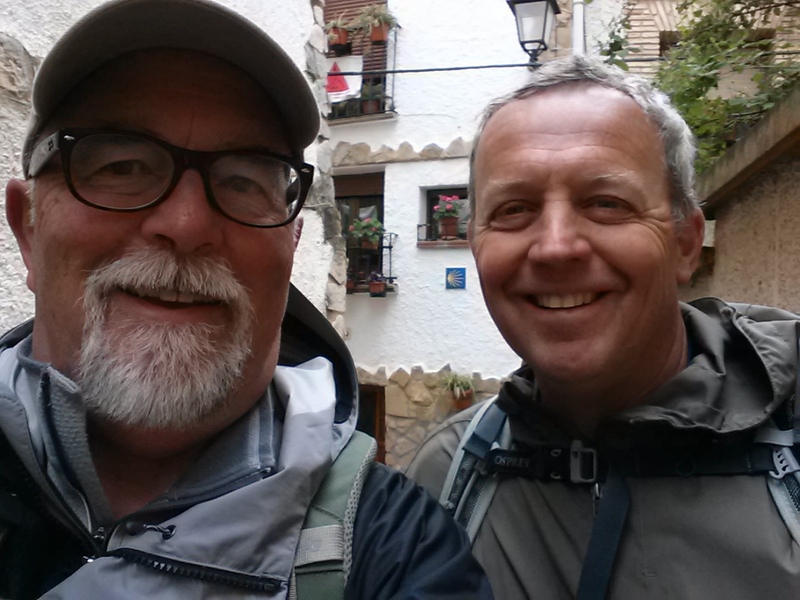 He and two others were walking a section of the Camino, and Greg had encountered him on the very first day heading up the Pyrenees. He indicated that he was going as far as Logrono this trip and would take a bus from there to Barcelona where he would fly back to Dublin. 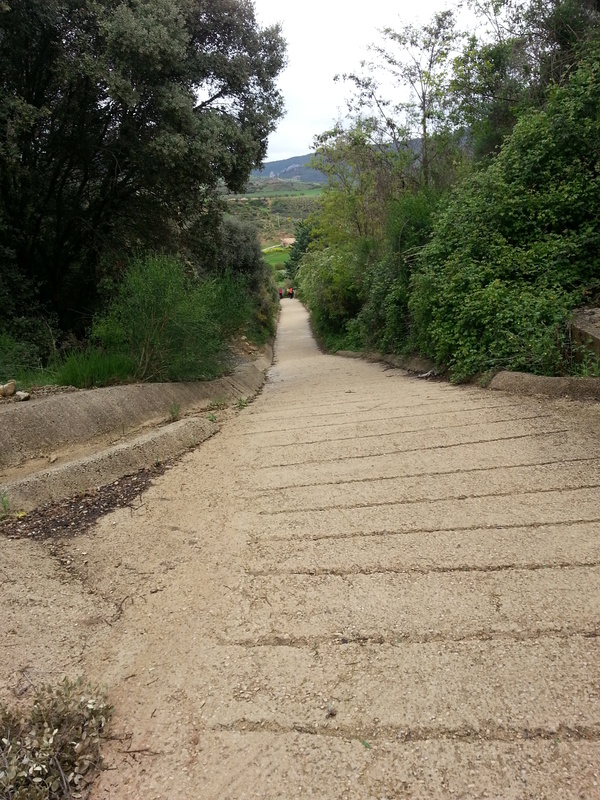 Outside of Cirauqui, we came upon a well-preserved section of the Old Roman Road. As we walked upon it, I began to ponder the probability that the Apostle James must have walked on this road during his time in the area nearly 2,000 years ago. We arrived in Estella by late afternoon to encounter the Canadian sisters arguing in front of a large map about where their hotel was located. We consulted the map also to find our way, but this didn’t last very long once we crossed over the river into the town proper. I stopped to ask directions from a woman who was sweeping her front steps. She was very pleasant, but we could only decipher a general direction from her comments. 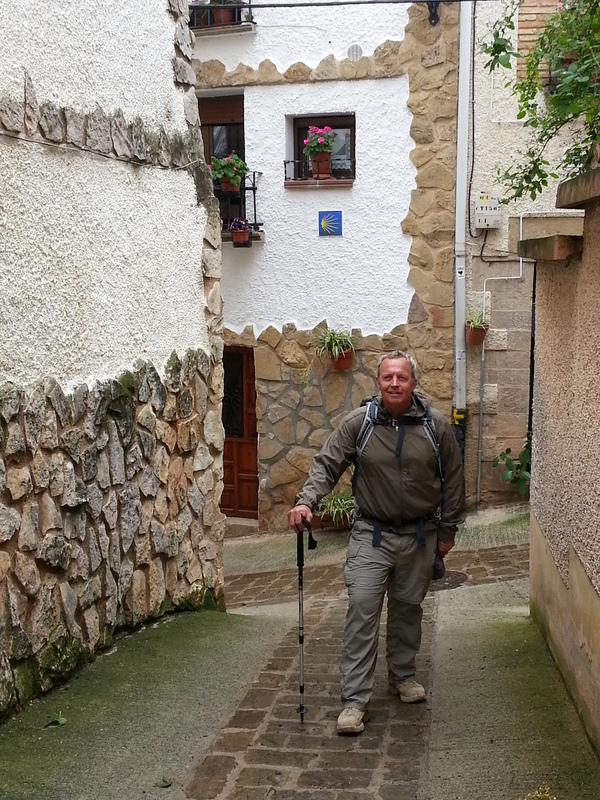 We headed that way and soon we found the narrow Calle Mayor and headed northeast. 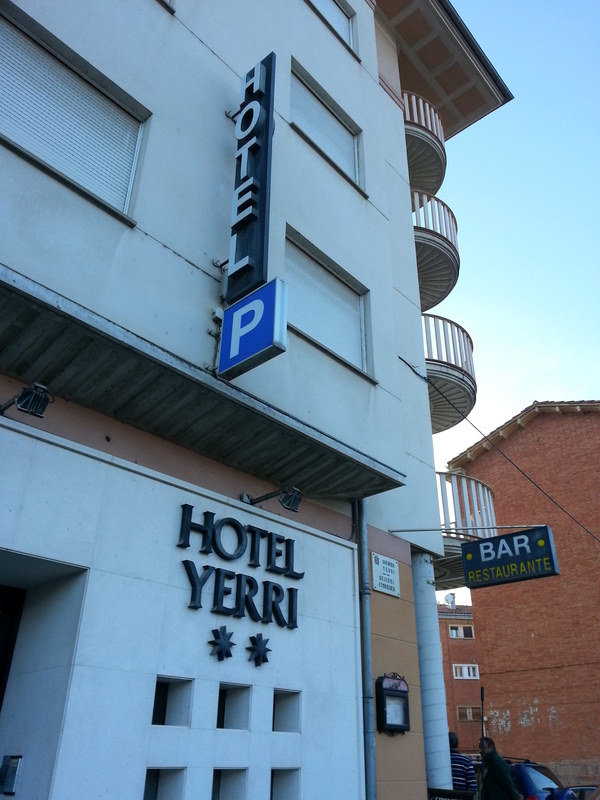 After a long walk through the city, we located the somewhat drab Hotel Yerri and checked in. Though drab and cold, this hotel was probably one of the better places in Estella, a town that has seen many better days for sure. Staying at the hotel was our Irish friend, Gerry with whom we had walked earlier. By this time he had been joined with the others in his party. For dinner, I had garlic soup for the first time and found it to be delicious. Pork chops and french fries were on the “menu del dia” along with the omni-present “vino tinto.” By now we were discovering that the menus for dinner in these places did not vary too much. The desserts were almost always the same, with the choices being ice cream, a small cake (torta) of some sort, or “flan.” As was becoming par for the course, the WiFi worked in the lobby only, and we were able to connect with Heather and Marianne via Facebook and e-mail while we sat in some rather uncomfortable chairs. By now it was about nine pm and we headed up to the room for bed.